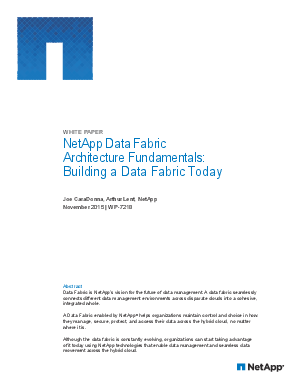 Data Fabric is NetApp’s vision for the future of data management. A data fabric seamlessly connects different data management environments across disparate clouds into a cohesive, integrated whole. A Data Fabric enabled by NetApp® helps organizations maintain control and choice in how they manage, secure, protect, and access their data across the hybrid cloud, no matter where it is. Although the data fabric is constantly evolving, organizations can start taking advantage of it today using NetApp technologies that enable data management and seamless data movement across the hybrid cloud.